My father loves to deep sea fish. One of the experiences in my life which has been the richest and most rewarding is having participated in the programs of an organization called Landmark Education. The promise of this organization’s Curriculum for Living is that “you will your life powerfully and live a life you love.” One of the greatest benefits of having participated in Landmark Education’s programs is that I have been able to share it with my friends and family, including my mother and my father. My father is 85-years-old, and several years ago was suffering from glaucoma in one eye, and cataracts in the other. Dad could still see well-enough to drive, read, go fishing, and do other things, even having cataracts; but his doctor wanted him to have surgery to improve his eye-sight even more. My father checked-in for a routine procedure. During the surgery, complications occurred, and a capillary in his other eye, the good eye, ruptured. It filled with blood. When my father emerged from surgery, he was totally blind. He could not see at all out of either eye. This was a major shock to me, and to the rest of the family. A vibrant, healthy, robust man had been reduced in an instant to an invalid. Talking with my father, I was upset and I suggested he take legal action against his doctor. It sounded to me as if negligence was involved. My father flatly refused to sue his doctor. He told me, “My doctor is a good man. He didn’t intend for this to happen. I have faith in him, and will continue to go to him.” Then I suggested my father let me take him to the Braille Institute to get a Seeing Eye dog, and other services to help him function without sight. Again he refused. My father told me “I am going to see again. I am not a blind person. My doctor is going to help me regain my sight.” I was moved by his trust, his compassion, and his resilience. He was full of confidence when he said these words. It seemed to go beyond positive thinking, something like an absolute commitment. When he said it, I actually GOT it was so. For the next two and one half years, even though he couldn’t see, he refused to let not seeing get in his way of fully living life. He continued to go deep-sea fishing with his buddies every other Monday. He listened to sports on the radio. He came to all of our family functions, and was as active in life as ever. Two and a half years after becoming blind, my father went in for surgery again for a laser procedure suggested by his doctor; the very doctor my father had trusted. When the nurse removed the bandages from his eyes, my father exclaimed, “I see BLUE! What a beautiful blue blouse you have on!” He had regained his eye-sight just as he said he would. I learned a big lesson from this. If my father had gone in the direction of suing his doctor, blaming him for his troubles, making him and everyone else wrong, he might have won a lot of money, and gotten a lot of sympathy and agreement; but he would still be blind. Because my father stood for possibility, stood for trusting his doctor, and stood for regaining his eye-sight, he was able to see the beautiful face of his first great grandchild when she was born and placed in his arms. I am totally clear that my father got all of this freedom and possibility out of having done the work provided by Landmark. I am clear that this work provides people with the things pharmacists and surgeons may not typically provide – pointing the direction one will go, and then going there, because you say so – the power to stand for a possibility, even when it doesn’t look very likely, and then to follow-through until you achieve it. I am deeply proud of my father, and of his commitment to his own health and well-being. Epilogue: After regaining his sight for a few years, another eye doctor offered my father another procedure to cure his glaucoma. My father was told there was a chance it would work, but also a chance it would fail. My father took the gamble, trusting his doctors. The procedure was “successful” according to the doctor, but my father ended up being completely blind. 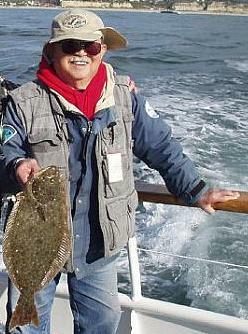 He still manages to go deep-sea fishing every other Monday with his buddies, but it is very hard for him, and especially my 89-year-old mother who now must wait on him hand and foot. I am still proud of my father, and I am very, very proud of my mother who still stands by her man after 69 years. The second surgery which left my father totally blind was in 2012. Now, it is 2016 and even though my father still holds faith that his sight will return it hasn’t. Now when he awakes or after dozing off in his chair he thinks he has flashes of sight. I believe these fleeting images are merely “dreams” because what he claims he saw does not at all match with the reality that surrounds him. He is 91 years old, and probably will never see again. The doctors don’t understand why. They claim his retina is healthy and intact. They think it might be his optic nerve. My 91-year-old mother makes his meals, launders his clothes, pushes him around in his wheel chair and waits on him hand and foot. I try to have them move to a full-care facility but they refuse. My father’s faith is still admirable, but it is all he has left. It is a tragedy that the last years of his life have been this way. My mother and father love each other deeply. That is all they have left is their love and the love of their family. After losing his eye sight in 2013 due to the “successful” glaucoma surgery my father has been totally blind for 5 years. He still is the eternal optimist. Just yesterday he claimed he awakens and sees perfectly for around 3 hours. But when quizzed about what he can see, he scores a zero on identifying objects in his room and colors, etc. He is probably dreaming he can see. The mind is “a linear arrangement of successive moments of now.” It simply plays back what he has seen in the past. His reality is a creation of his mind. But can you not say the same about us all?